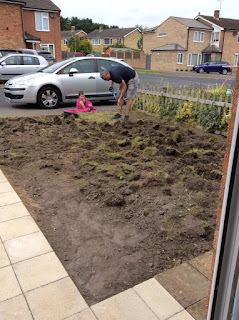 Mum of Five Staying Sane: Our DIY garden makeover on a budget. 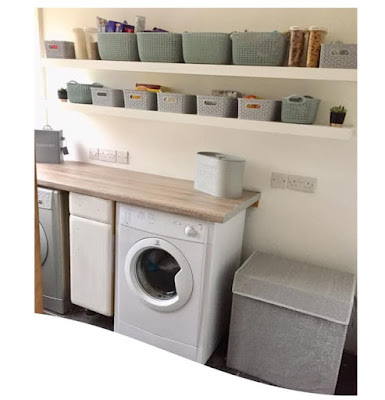 How to make an unloved space look nicer. Finding bargains to stick to your budget. Our DIY garden makeover on a budget. How to make an unloved space look nicer. Finding bargains to stick to your budget. Our garden makeover on a budget! Since our home extension three years ago the poor front garden has been neglected and left as it was once the extension work had finished. 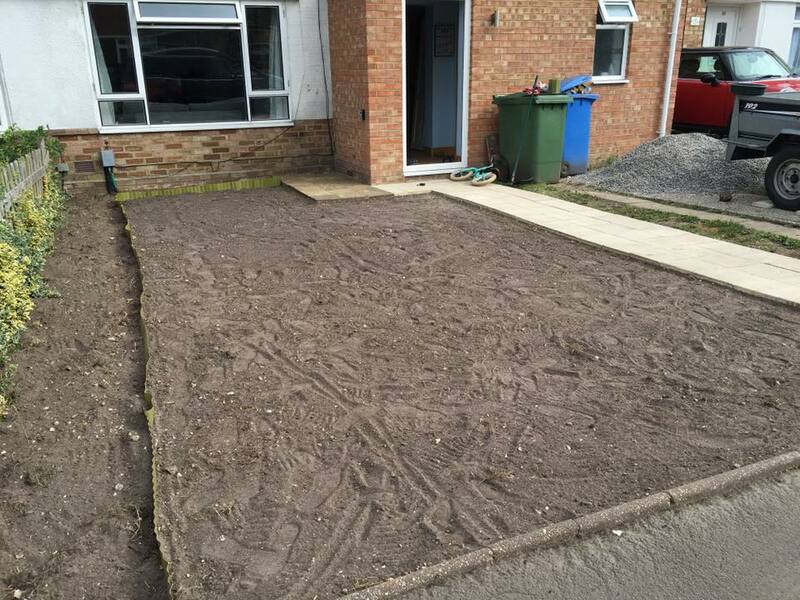 On the start of the extension work some of the original driveway had to be dug up to make way for the extension. The front garden was used as a permanent site for the skip and rubbish for around 6 months and once it was all gone we were left with a patchy grass area which was very uneven and when it rained a huge puddle would appear right where you had to walk to reach the front door. 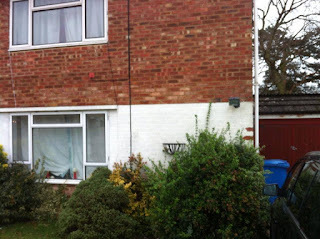 This picture is from before the extension, the front door was on the side of the house and there was a lot of shrubbery! After the extension was complete we had a front door on the front of the house but no path to the door, driveway to the right and to the left out of picture was the garden which had seen better days, this stayed like this for 3 years! 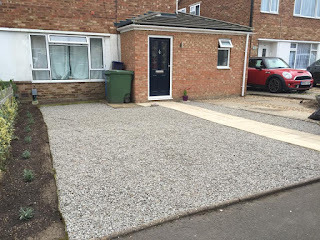 All sorts of ideas were thrown around about what to do to improve the front garden but with a very limited budget things like block paving were definitely out of the question. 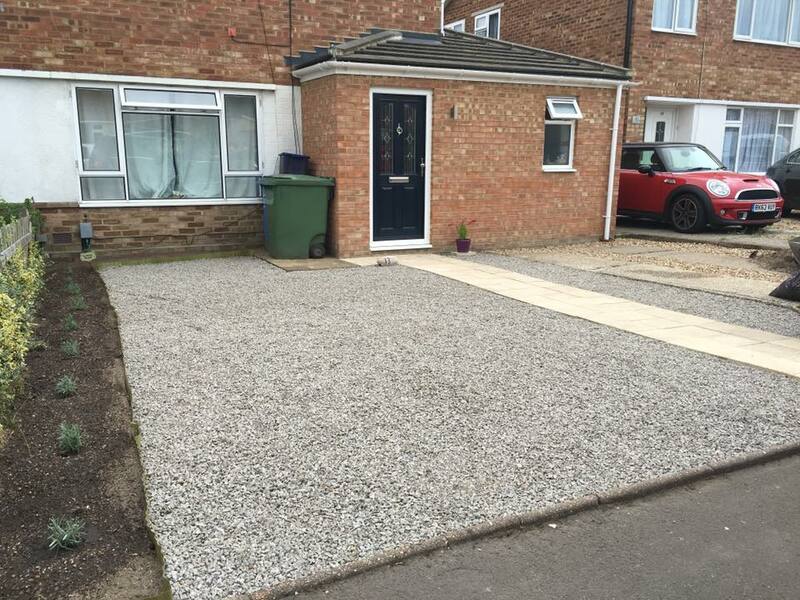 The thing is, as part of the building regulations we had to make the front garden into a space that could hold more than one car. 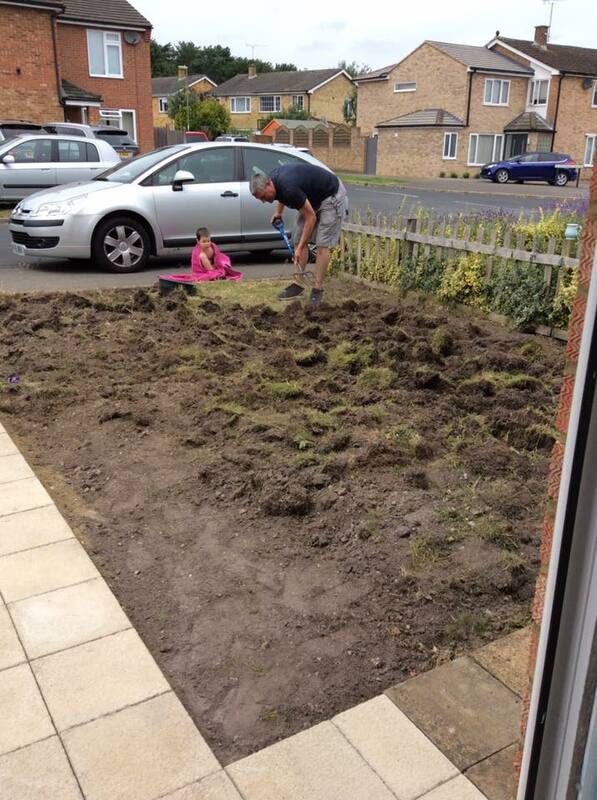 So we couldn't make the grass area flat and then regrass it all, it had to go. As always my amazing Mum was on hand with her bargain finding skills and also her ability to get us all motivated to finally get the job done! The makeover commenced just a few weekends ago where we put down the path first. 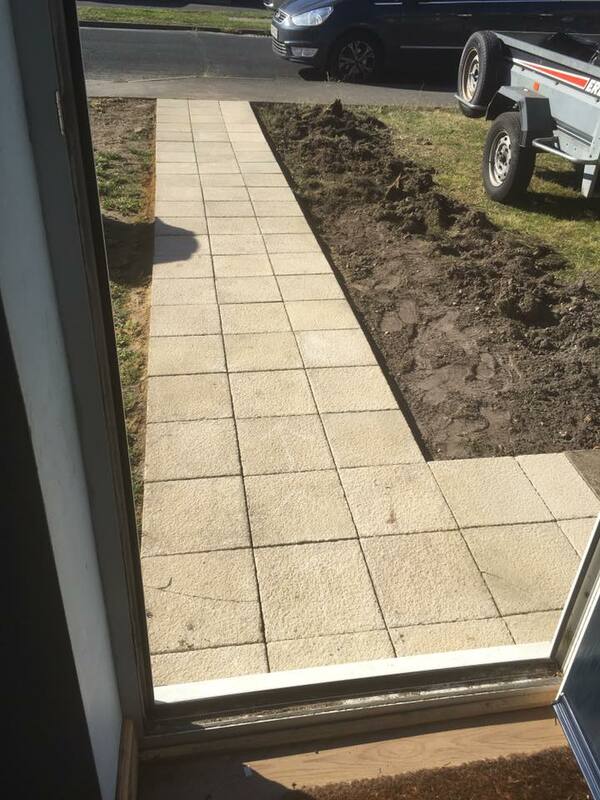 We haven't had a path to the front door since, forever! The old front door used to be on the side of the house so you used to walk down the driveway to access it but when we extended the door got moved to the front of the house. The cream slabs that have made the path were originally my parents old patio which got taken up a couple of weeks prior to our garden makeover. The path took a good morning and half an afternoon for the men to put down whilst myself and my Mum started on a border and sifting dirt from stones and turf! 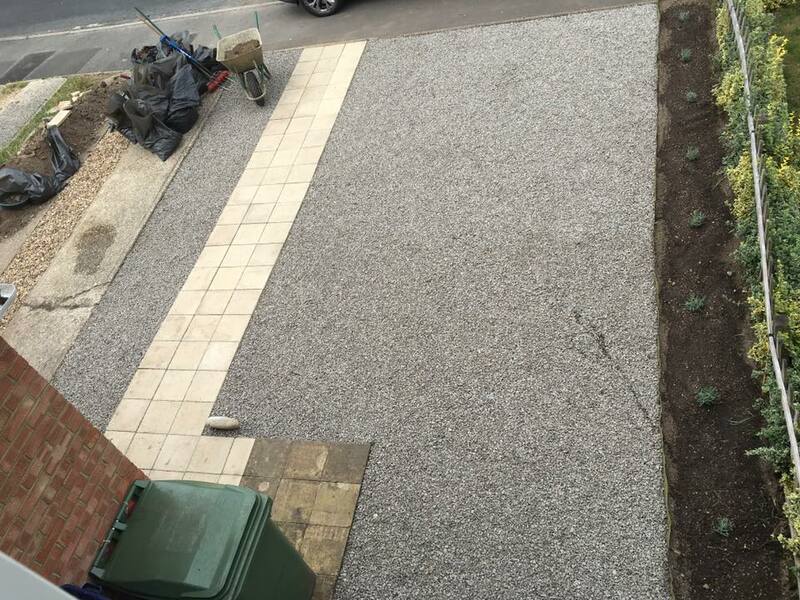 After the path was laid and also some extra slabs put down for the bins to sit on it was time to get rid of all of the grass and prepare the garden for some decorative stones. This was another amazing find by my mother and we bought them off eBay for just £19.99. 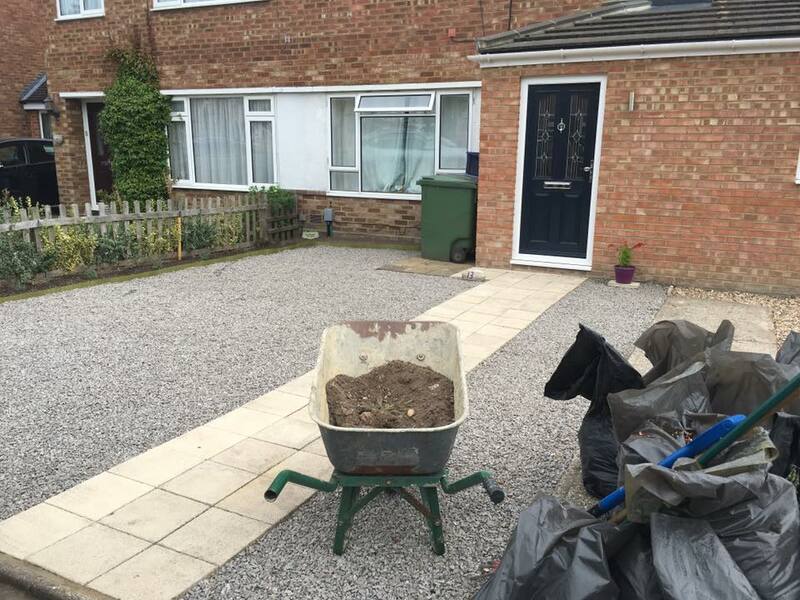 They were collected locally and we thought there would be enough to cover the main grass area we had dug up and we would have to find something else for the right hand side of the path and in between the old bits of the driveway. I'm unsure if Thing 5 sat in a towel was of any help to Daddy, he was probably telling him to work faster! 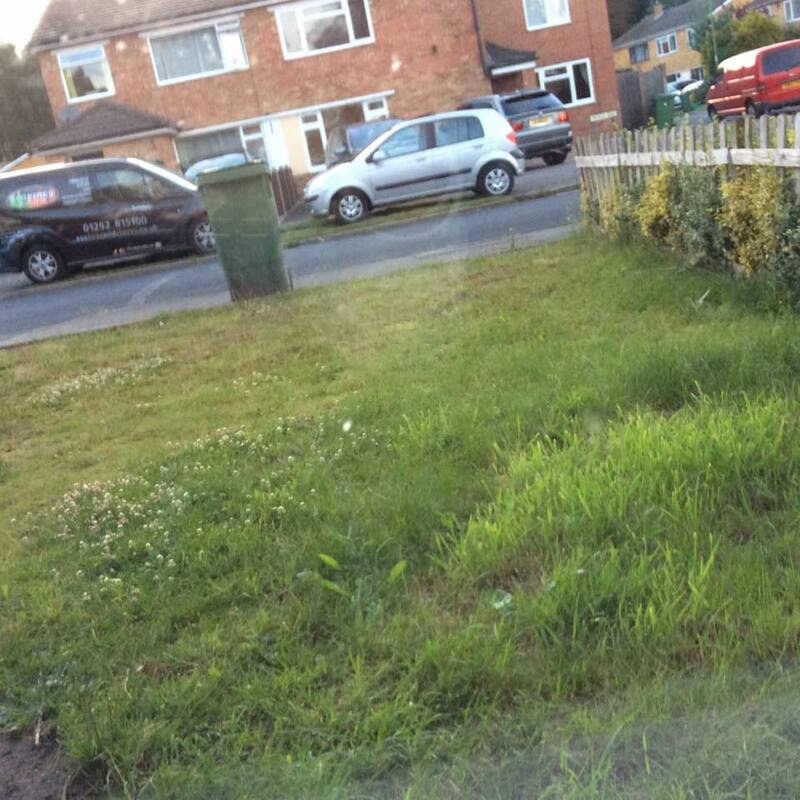 Clearing all of the grass and trying to make the garden fairly flat compared to what it was. We put a small border in so we made sure we weren't short on stones for the rest of the garden! 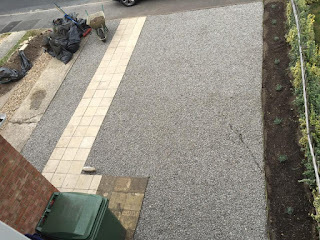 I purchased some weed control membrane from a local store for the princely sun of just £4 and we got to work shifting the stone from a pile on the driveway on to the newly flattened garden. Before we started it ran downhill towards to house but with a huge lump in the middle of it. Between us all we did our best to remove all grass and level as much as possible before putting the stones down. In the week running up to this next stage the wonderful mother (again!) found someone giving away some more stones on Gumtree FOR FREE!. 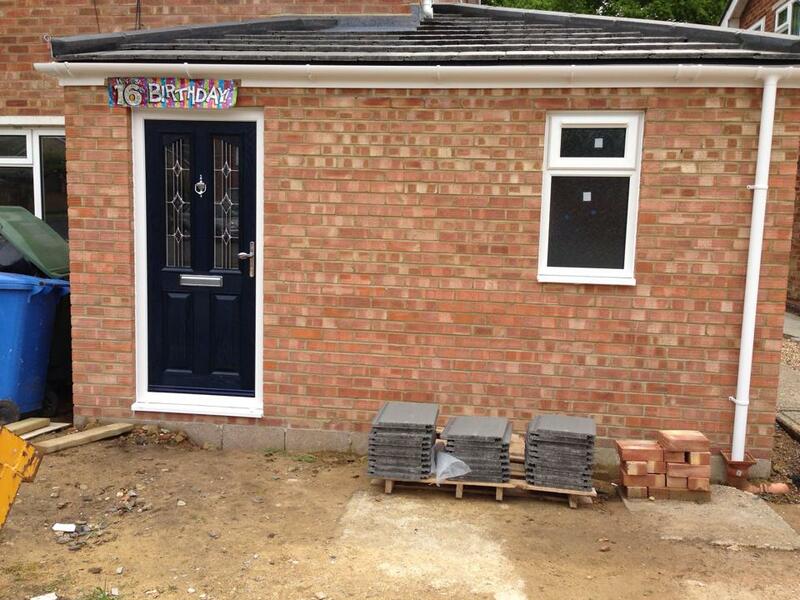 They didn't match the stones that were on the main garden area but they would do for the driveway side of the house. So again off my parents went to pick up another trailer load of stones. This past weekend was where the garden magic happened! I roped my brother in to help out and the parents turned up at 8.30 am (thanks parents!). 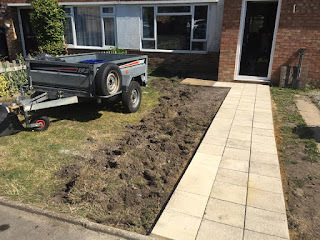 First we laid the stones on the main garden area and couldn't start on digging up the areas between the existing driveway until these had been shifted. I ideally wanted the greyish stone to go either side of the path but we weren't sure it would stretch that far but we managed it, just. It was the perfect amount and was a made to measure bargain that my Mum managed to find! After pictures! There are still a few finishing touches to be made and some bags of rubbish to dispose of but overall we are very pleased with the end result. 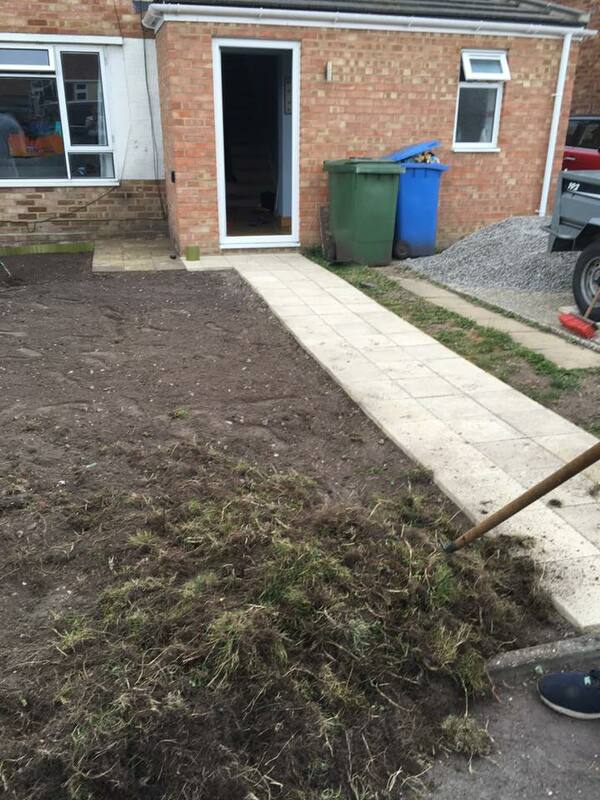 Once that was sorted we started on digging up all of the grass and weeds from in between the old driveway and making it level enough to take the other stones. We purchased some lavender to go in the border that we had dug as this will soon grow and bulk out and fill that space down the left hand side. I also remembered that I had bought some solar lights a few weeks ago from a local garden centre but didn't want to put them out in the old sad looking garden so had waited for the right time. I unwrapped them and put them along the border and they look lovely when they come on at night. These were just 4 for £10. 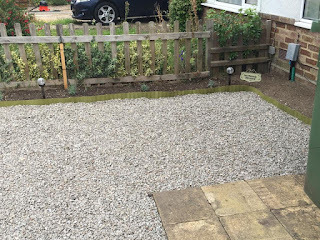 All in all it cost £19.99 for the stones, £8 for the membrane under the stones, £9 for the lavender, £9 for 5 extra paving slabs that we were short of on the path and £10 for the lights. I paid my work force with lunch and cream cakes and we are very grateful to my parents for their bargain finding skills and their hard work to help make this all happen. I am so pleased it is all done and looks fab instead of drab and all for the grand total of; £55.99!! 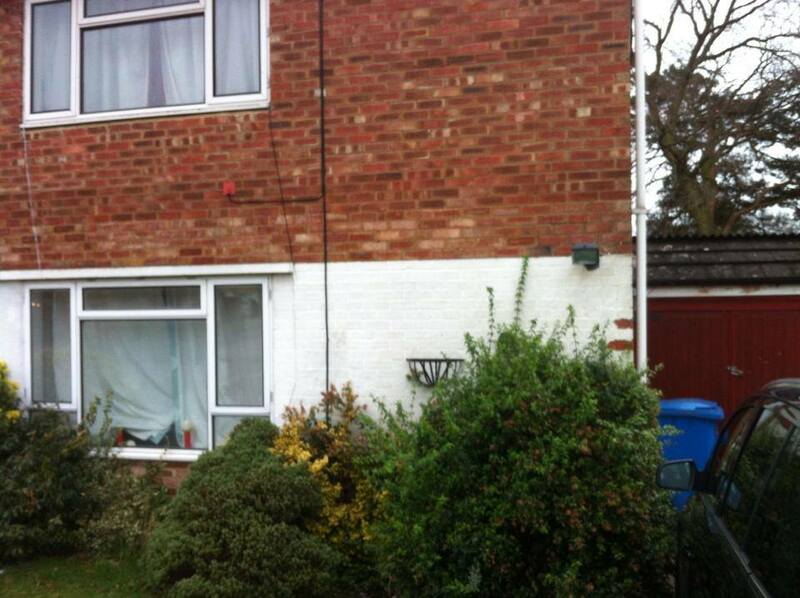 I thought I had taken a full before picture but you can see from the extension pictures that I have put up what it was like before, just without the skip still there! 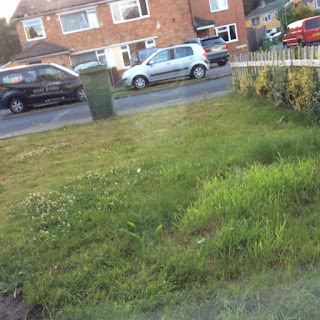 Thing 5 had taken a lovely picture of the grass before we started so that is his offering of a before pic too. My last wants are 2 topiary trees for either side of the front door, a number plaque for beside the front door and something else to go in the bedding area underneath the windows. I also find some wooden edging to go around the border which will cover the green plastic edging. This will all come together eventually but the main part is done and I hope you agree it is a huge improvement on what it looked like before.